Accessories: One pair oars included. Transport: Via VRL Logistics, delivery in approx 4-8 days to closest VRL godown to you in India. 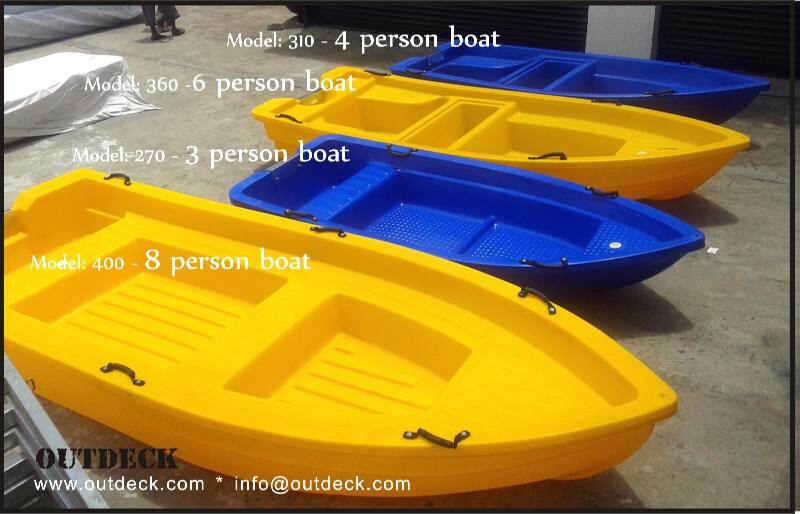 Multipurpose boat for 1 person, 2 person or 3 person boat. You'll love spending a week at the lake with one of these tough yet lightweight fishing boats. This small, light boat fits easily into most SUVs or on a car top carrier. The boats require minimal maintenance. This gives users more time to enjoy “simple boating”. This lightweight, affordable, multi-purpose boat holds up to 4 people, is super stable and works great with a small petrol outboard motor or electric trolling motor. Great boat for the beginner angler and the veteran fisherman alike. Versatile to fit with outboard motors from 3 hp to 9.9 hp or with electric trolling motors with a transom height of 15 inches, the boat is easy to transport and maneuver. Weighing only 80kg, this boat can accommodate 6-persons or 750 kg load. Given their stability, safety, versatility, and extremely reasonable cost, they are just about the best value boats. A solid boat for carrying people or luggage, this boat is perfect for tenders or as a recreational boat made out of tough and reliable plastic. The ideal boat of choice for a rescue boat or an affordable pleasure boat for backwaters, inland lakes & bays.